1. Proverbs 17:17 says that a friend loves at all times. What are some ways that friends can show their love to each other? 2. Luke was a doctor. He often went with the apostle Paul on his missionary trips to different countries. Paul may have had bad eyes. He was also persecuted for telling others about Jesus. He was beaten and whipped and stoned many times (2 Corinthians 11:23-27). It would have been a hard job to be Paul’s doctor. But Luke was more than his doctor. He was also Paul’s friend. At the end of Paul’s life, he was in prison in Rome. He was chained to his guards and he knew he would soon be put to death. He was cold in the prison, and sad. Some of the men who had traveled with him had given up and left him. But Luke hadn’t left. He was a true friend who “loves at all times.” Paul said, “only Luke is with me” (2 Timothy 4:11). As you listen to this episode, think about what it means to be a friend at all times. In this episode, Liz, Lucille, and Morrie tackle a secret assignment—to make a new friend. But Liz learns that not all friends are good friends. One of the important things about being a good friend is helping others stay out of trouble. If you see a friend making bad choices, don’t follow them and make bad choices too. But don’t just walk away either. Talk to them. Let them know why their choices are dangerous. Encourage them to choose the right thing. Paul told the Christians in the city of Thessalonica to “encourage one another and build each other up” (1 Thessalonians 5:11). To build someone up means to make them stronger by helping them obey the Lord and make good choices. We all need friends who can do this for us, and we should be the kind of friends who do that for others. Want to dig deeper and learn more about what it means to be a friend? Check out Proverbs 12:26, Proverbs 17:9, and Proverbs 22:24. What assignment did Miss Wattle give her class? They each had to make a new friend and write a paper about what they learned. 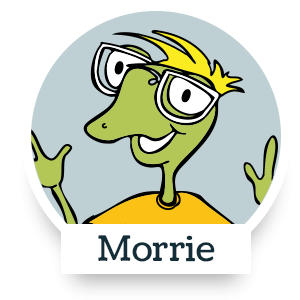 Who became Morrie’s new friend? How did Lucille start her conversation with Tara? Where did Liz look for new friends? Some kids aren’t the right kinds of friends. Your challenge is the same as the one Liz, Lucille, and Morrie had in this episode. Make a new friend. Use the lessons they learned about how to make friends. Also make sure, like Liz did, that you’re making the right kinds of friends. It’s a good idea to let your parents know you’re doing this so they can be your friends and encourage you to make wise choices.